Want to take more control over your investing dollars? Want to take this control but still get professional, expert money management at a low-cost? BMO SmartFolio can help you achieve both goals – and it’s about time. For long-time readers who have been fans of my blog over many years, you’ll know I used to sabotage my portfolio in many ways. I was not My Own Advisor but rather My Own Worst Enemy. If your investing journey was anything like mine, you didn’t worry or think about your future much because it was so far away, and you blindly took investment advice from your elders. Looking back, I wish I could have provided better financial advice to my younger self. But all is not lost – including taking action right now. This is especially true because the financial technology/fintech revolution has launched more online investing options to Canadians that not only improve their investing behaviour but help to keep more money in their pockets. Bank of Montreal (BMO) officially began conducting business in 1817, making it Canada’s oldest bank. But being old doesn’t mean stubborn to change. Over the years, BMO has been progressive in launching many financial products (such as their own suite of Exchange Traded Funds (ETFs) through BMO Global Asset Management, and launching various low-cost investing solutions through BMO InvestorLine and BMO Nesbitt Burns’ SmartFolio. Did you know that you can invest online with BMO SmartFolio and you won’t pay fees on your first $15,000 invested for a year? I’ve also been a shareholder of Bank of Montreal for many years – you can check out my post then and now here. Canadians are slowly catching on. They realize compounding is powerful, and higher fees (along with My Own Worst Enemy behaviour) can kill portfolio values over time. This means the lower and longer you can keep your financial costs down to run your portfolio, the wealthier you can be. This where BMO SmartFolio can help. SmartFolio uses BMO Global Asset Management’s suite of low-cost ETFs to build their investment portfolios for clients. On top of that, many of BMO’s ETFs are award-winners, providing the best ETF in the Canadian equity investing space; providing the best ETF in the U.S. equity space; and more. Costs matter – I get it – so how much does SmartFolio cost? BMO SmartFolio charges an advisory fee on each account. There is a $1,000 minimum threshold when opening an account and an advisory fee will apply to you – in a tiered approach. The more assets you have however, the lower your cost. Household accounts can be grouped together. Meaning, the combined household assets can reduce your annual portfolio costs above. There are no commissions for the trades made by BMO Asset Management’s portfolio managers to re-balance your portfolio. This is a huge benefit over DIY investing to buy or sell your own ETFs or stocks like I do. While management fees above do not take into account the Management Expense Ratio (MER) of the ETFs owned, you should expect BMO’s managers to keep your costs low in the range of 0.20% to 0.35%. Those costs are far lower than the higher-priced products I used to own in my 20s. Live and learn and pay it forward. What can you use SmartFolio for? 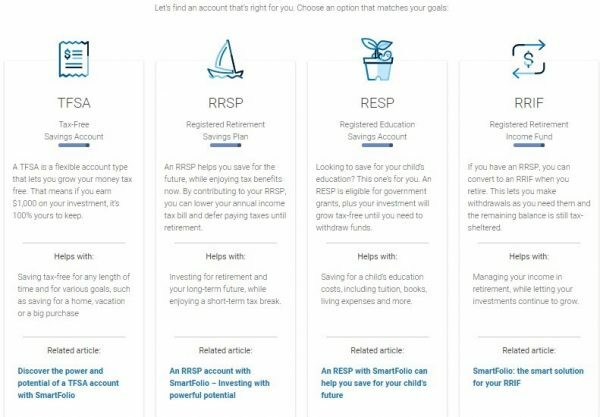 You don’t have to follow my lead (since we focus on maximizing contributions to our TFSAs and RRSPs for our investing journey) but I think SmartFolio makes great sense for registered investing long before you invest in a taxable account. That said, SmartFolio does offer investment accounts for those that have maxed out their registered holdings – lucky you! The beauty lies in its simplicity: SmartFolio is designed to provide you with a diversified, low-cost ETF model portfolio so you don’t have to figure that out or manage it on your own. Over many years of investing, a structured, re-balanced, low-cost portfolio can deliver better returns than a costly portfolio of funds you trade in and out – reacting to stock market ebbs and flows. SmartFolio works because it leverages the benefits of software algorithms with work performed by professional portfolio managers. They are combined to do the heavy lifting for you. The software highlights trends in market performance and macro-economic data. The portfolio managers use this data to benefit your portfolio. For example, before managers introduce a new ETF into your portfolio, they will weigh the risk, prospective returns and costs based on the algorithms. It’s systematic and thorough. Your SmartFolio model portfolio is monitored on a daily basis and trading activity is kept to a minimum. You can expect your model portfolio to be rebalanced 2-6+ times per year. Expert portfolio managers provide a human element by verifying every position and ensuring they are philosophically consistent with your model portfolio’s investment objectives. This blend of robotics and human touch is what makes this solution so appealing. Fill in an online questionnaire and get rolling. That’s it. Fill in this questionnaire below to ensure you get $15,000 managed for free for your first year. Answer the risk-based financial questions. Determine how and how much you would like to contribute to your accounts. Start saving for your contributions. You can set up automatic transfers based on your existing BMO bank account, use pre-authorized transfers or set-up a bill payment to BMO. If you have an existing BMO savings or chequing account, you can track your money across all accounts with ease, safety and trust – BMO Nesbitt Burns who oversees the SmartFolio product and its investor’s assets is a member of the Canadian Investor Protection Fund (CPIF). Can I talk to a real person if I have questions? Like I mentioned above, your SmartFolio account will be managed by a team of portfolio managers with hundreds, yes, hundreds of years of collective investing experience – more years than BMO has paid a dividend! Summary and great offers for you! The fintech revolution has been kind to Canadian investors. This wave continues to drive down investor costs and improve financial transparency across the industry. This is a HUGE win for retail investors like you and me – who are doing what we can to build our wealth. long with other established and trusted brands, I am happy to offer this special BMO SmartFolio promotion to my readers should you wish to take advantage of it. You can invest up to $15,000 for free with SmartFolio – for one full year. You can use this year as a free test drive, you can use this offer as young investor starting your investment journey; you can use this offer to manage an established retirement portfolio or you can leverage this offer for any age in between. SmartFolio advisors can be contacted at any step in the investing process at Smart.Folio@bmo.com or by phone at 1-844-895-3721. Love to chat? Use the online chat option by going to www.bmo.com/smartfolio. Full disclosure: MyOwnAdvisor.ca is a partner with BMO, and has a referral program in place with BMO Nesbitt Burns. BMO SmartFolio is a product of BMO Nesbitt Burns. 23 Responses to "BMO SmartFolio Review and Offers"
Awesome what??? Don’t leave us hanging like that! Promo code 🙂 I hope it’s fixed now my friend! Thanks for being a fan. Although I’m not a SmartFolio user, I am a BMO Investorline self directed customer. And very satisfied with it. More cost effective options for investors is a good thing. BMO has built a good list of ETFs. Yours truly handles things in this household but you never know what may happen over time to necessitate a change. So I get that you’re being paid to post something like this. By why not be impartial and recommend a standard robo advisor that charges less in fees. Or one of the new vanguard products (Symbol = VCNS, VGRO, VBAL) that charges even less? Any fees about 0.5% are unacceptable in this day and age. Fair Brett but I have done such posts in the past on my site as well; thereby saying in dozens of articles on my site that I’m rather agnostic when it comes to what financial products people should own. Who I am to say that? I don’t know their objectives, goals, circumstances, other. BMO’s SmartFolio is a good product and exceeds many pricey financial advisor alternatives. Are there other options? For sure. I will eventually write an updated post about some all-in-one funds or funds of funds. To your point about 0.5%, that is far better than 2% but I can appreciate what you are saying when there are other lower cost alternatives out there for those (like you?) with more financial literacy AND who have a larger general/invested interest in their investments. No Canadian investor is the same. Anyhow, kudos to you. What are you investing in if I might ask? I didn’t disclose the % points for obvious reasons. My weighted fees on this portfolio are 0.08%. This portfolio isn’t right for everyone but it works well for me. I’ve nudged my family members towards robo advisors but i would prefer they buy VGRO if i was doing it for them. There is just no reason to ever pay above 0.5% and although the banks are trying to compete with Robo’s they are having a hard time giving up their cash cows. I like your blog, as an indexer, I do enjoy reading about the dividend investors just to make sure I haven’t missed anything… I truly hope it doesn’t turn into another financial advisor recommending inferior products because they’re being compensated on them. That’s cool Brett re: finance club. I have no problem with robo-advisors, in fact, I also have a partnership with ModernAdvisor. I’ve worked with them for a few years now and know the CEO rather well. VOO is a very good product with very low fees. Since 2010 it’s been on a tear. Also ahead of both VTI and VYM (I own that) over the last 8 years. Interesting you own XIU over what other indexers might prefer in ZCN, VCN, etc. Personally I’m a HUGE fan of XIU. I figure if those top-60 stocks are not making money this country is sunk. Surprised a bit you own QQQ while you also own VOO (S&P 500). You before VOO was created I used SPY and other symbols before I found the vanguard ones, but the index’s they reflect haven’t really changed much in the last 15 years. Mine works well for me, but it likely won’t work for others. It isn’t as volatile as straight S&P investing but it definitely has its ups and downs still. Thanks for sharing Brett. I’ve owned VWO and VEA in the past, I have since sold them, and then I owned VXUS over the last few years – have since sold that ETF over $60. I recall VXUS is now about $56. For whatever reason, maybe I’m not willing to wait 10+ years to see decent returns, I have failed to be patient with emerging markets and have gravitated to owning my CDN stocks and U.S. stocks with some ETFs as well. I am looking to add more VYM to my portfolio over time. I am considering adding an international dividend fund in the coming year – potentially IDV. The bias to some income-oriented ETFs is I will be looking to “live off dividends” within the next 10 years. Based on $CAD the S&P500 index has averaged 12.22% annually between 1970 and 2017. Over the same time frame the TSX index averaged 10.55% and EAFE index 11.89%. The Canadian market may only make up 3 to 4% of the global market and trail in long term performance numbers but I wouldn’t consider investing in the index anyway because of its high concentration in financials and energy. Its not terribly difficult to achieve alpha with Canadian stocks long term via a more diverse mix across the sectors. I suppose this is why I invest in CDN dividend stocks – I see the top holdings of the TSX rarely change and the same companies that have paid dividends for generations, they keep paying them. I do and likely will, use more low-cost ETFs over time to invest in the U.S. and abroad as I get older. The ETFs offered per Smartfolio are all in-house BMO index ETFs. Considering the all in Smartfolio costs range between 0.60% to 1.05% you’d think there would be a larger universe of ETFs to choose from. For that matter, if going the all in one index ETF route, why not choose one of the new Vanguard offerings instead? They’re 2X to 4X cheaper and don’t have maintenance costs. For the record, I’m a self directed BMO InvestorLine customer. I don’t own ETFs but if I were to own an ETF portfolio I’d switch to Questrade. They don’t charge commissions on ETF purchases. Well, you could consider a combination of ZCN and some others. ZCN is uber-cheap. I often wonder Bernie if BMO might have commission-free funds for their own products – eventually? I mean, image buying ZCN or other low-cost products commission-free…that would be great and likely draw more AUM (assets under management). You’re another happy BMO InvestorLine customer I take it? Can you DRIP U.S.-listed ETFs and stocks with them? I recall they didn’t have that before. I believe BMO InvestorLine allows synthetic DRIPs but am unaware if that’s available with U.S. listed securities. I’ve never DRIPed with anything outside of mutual funds. It would be nice if BMO waived commissions on their branded ETFs and eliminated trailer fees on mutual funds but, so far, this hasn’t come to light. I like it that they now allow purchases of competitors “D” series mutual funds. As with other mutual funds there are no commissions or front end loads. I don’t know for sure…but I could see them doing that in the years to come (re: BMO waived commissions on their branded ETFs). As for mutual funds, based on their structure, I suspect trailer fees will remain although I believe they are going away kicking and screaming! Yeah, last time I checked BMO unlike Royal, TD, others won’t allow you to DRIP most U.S. stocks or ETFs. I would have to call and confirm though. I guess my cynical nature can’t fully agree with this service being really any different then many others especially you include the fee the etf charges. For example I have owned ZUH for quite some time now, If you add the 0.7% charge to the 0.39% charge of that ETF you now have a 1.1% combined fee MER. We now start to get into lower fee mutual fund cost territory. To me this is just how “advisors” are getting around the backlash of people waking up to high MER’s and fees and have come up with new packaging on an old game. You can do really well simply investing with as little as 2 to 4 good ultra low cost ETFs. I don’t really think you need an advisor to maintain a simple but effective ETF portfolio. Are these the same “advisors” that you get when you call a bank that have passed some kind of ETF “sales” courses internally and don’t really even know their own products and proper portfolio construction? I believe they would have to be supervised by someone with a licence of course, because they are securities. For me personally, the whole concept of ETF’s is based firstly on reducing your fee’s. Adding 70 basis points for questionable value has to be a consideration before plunging in. Just my 2 cents here. Nothing wrong with cynical Paul, but compared to what I was personally invested in – had I know this was available to me years ago – I would be WAY further ahead of where I am today….such is life. “You can do really well simply investing with as little as 2 to 4 good ultra low cost ETFs.” Totally agree. It will be interesting how this BMO model evolves over time. 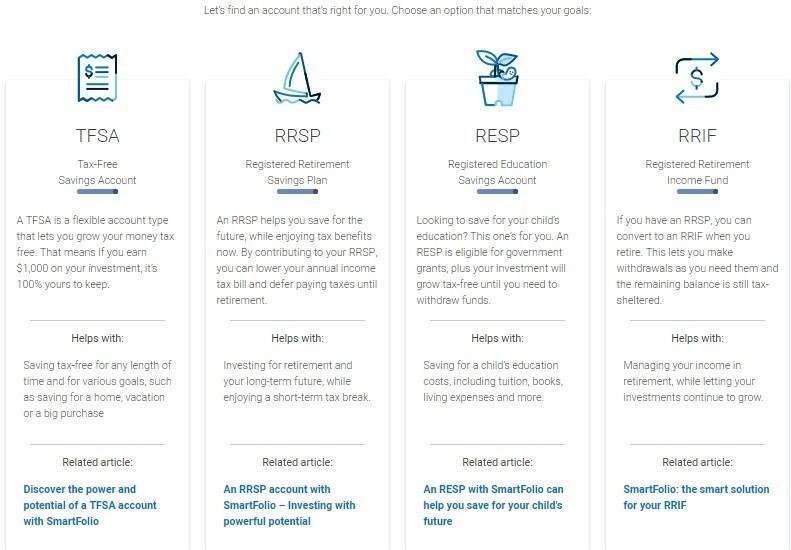 If you go here: https://autoinvest.ca/calculator/ You’ll see that BMO Smartfolio ranks around 4th from the bottom on due to their fees. The top 5 is probably where you want to be. All quite low depending on how you intend on funding the account. ModernAdvisor, WealthSimple, and Nestwealth seem to always finish top 3 depending on how much you start with and how often you deposit money. See for yourself though folks. Definitely, do your research before selecting a product/place to put most of your net worth. Thanks Brett. I’d add that calculator to my Helpful Sites page as well. I knew about it but haven’t seen it in action!